These mittens are going to be a Christmas present for my sister. 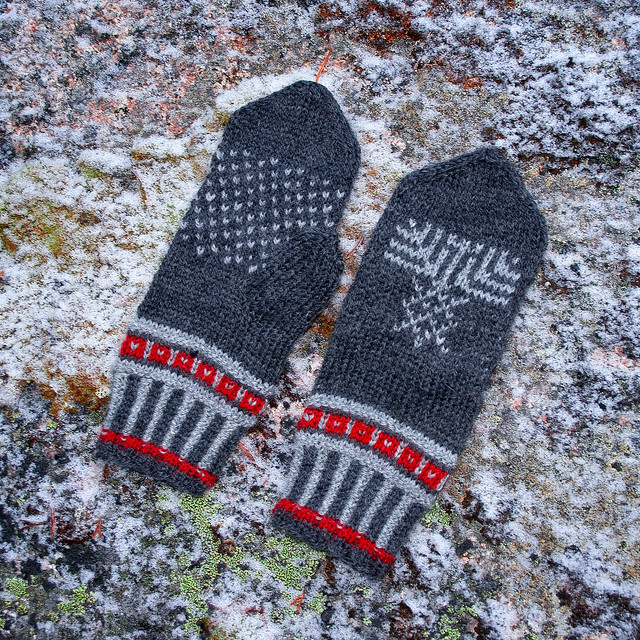 They are traditional North Karelian mittens. North Karelia is a region in eastern Finland and it’s where our father comes from. This makes me and my sister half North Karelians, yes? Traditionally these mittens are very dark brown, white and red. I didn’t have all those colours and as I wanted to start these mittens sooner rather than later, I tweaked the colours a bit: dark gray, light gray and red. I used Novita’s discontinued Florica yarn, which is 100% wool. The traditional Karealian snowflake motive is also a reminder of the (Russian) orthodox tradition of the region. I’m very pleased with the mittens and with the fact that I actually made them – at last. It’s been a plan for a few years now. I want to make a pair for myself too sometime. I will make mine with a slightly thicker yarn though because my hands are a lot bigger than my sister’s and these mittens are a little bit small for me. They are beautiful. Thank you for sharing the symbolism.